How simple--and frugal--is this? UK blogger Just Jake does a creative makeover on an inexpensive ring-bound notebook to produce this bright and creative Christmas planner. Finding her makeover material at the "pound store" (that's "dollar store" to us Yanks! 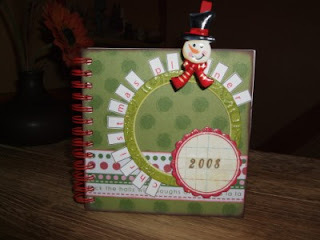 ), she's documented the before, during and after of turning a spare notebook into a work of Christmas art. Innovation we love: a recycled clothes pin, or "peg" in UK parlance, stands in for a receipt envelope. Clever Jake!